It’s like swallowing a whale. 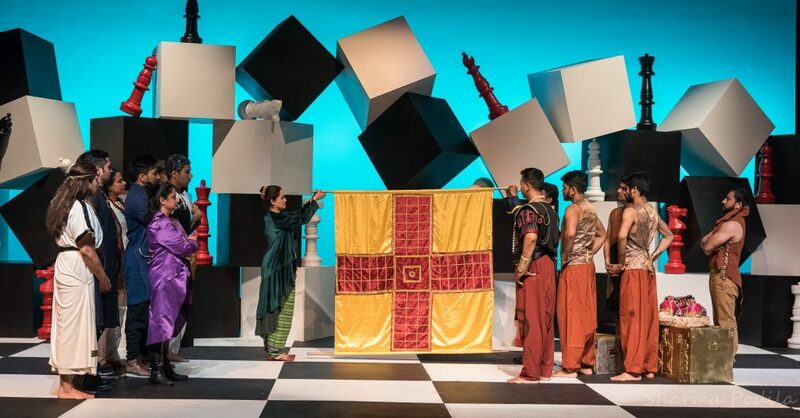 That’s what it has meant to the plucky and talented all-volunteer team producing an adaptation of the Mahabharata, the world’s longest epic poem, now on stage at the Cubberley Theater in Palo Alto. The new musical is Naatak Indian Theater’s most ambitious project yet. Onstage, the colors are mesmerizing, dancers in three classical styles are enchanting, the singing is clear and penetrating, and the detailed drama is fleshed with dance and a core acting team of fifty. An abstract set of black and white cubes with huge chess pieces mysteriously frames the action. and made me wonder how a strategy game symbolically relates to the overall work. Soon it is revealed that the themes of gamesmanship, cheating, rules, winners and losers thread through the drama. The Mahabharata, ten times longer than the Iliad and Odyssey combined, tells of a mythological war, and the dynastic factions that created it. 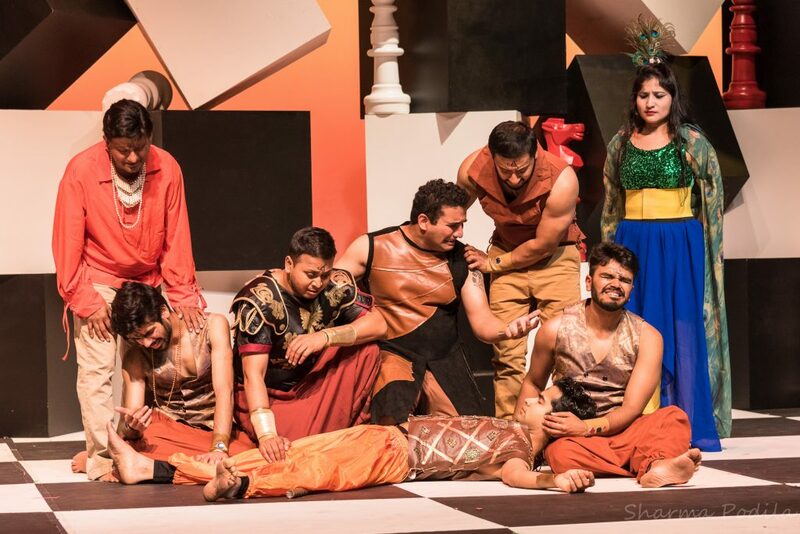 Sujit Saraf has adapted this epic for the stage, foretelling the fates of the opposing Kaurava and Pandava princes. 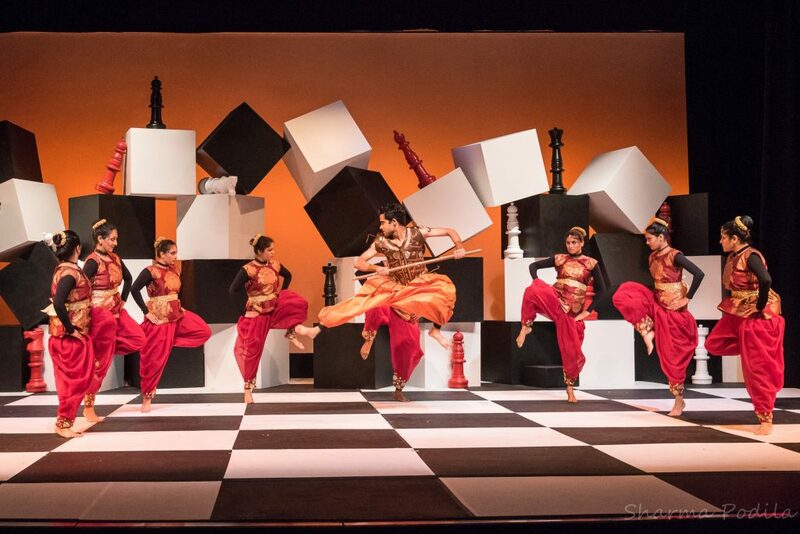 The plot unfolds through dance, acting and the original music written for this musical by Music Director and principal singer, Nachiketa Yakkundi. How do you contain this leviathan of a tale? It is pieced out for us in chapters introduced by a storyteller to a young king who wants to understand his ancestors’ dynastic struggles. Classical dancers vividly pantomime each chapter. With so much epic to cover, the words and names flow by in a rich stream. “Mahabharat” begins with brilliantly enacted genealogies, reminiscent of dynasty catalogues in the Bible and Iliad, using the oral tradition of Indian mythology. The rigged dice game begins. The central story describes royal cousins who are ordained to share a kingdom, but quickly devolve into adversaries. The Kaurava cousins are spiffy dressers, with crafty personalities, working secretly to cheat, exclude and ultimately banish their cousins by a rigged dice game. The Pandava cousins wear simple clothes and follow the sacred rules. But, they naïvely make poor choices in gambling and in war. The Pandavas prevail because they have two advantages: they are pious and have the wise Krishna on their side. Good humor and delightful high-jinx punctuate Saraf’s “Mahabharat.” The hero Arjun declares he will kill his adversary the very next day. And should he fail, he vows to suffer an amazing catalogue of sins and retributions. The list includes forty infamous acts—most memorably preventing a cow from drinking, and eating with the left hand! Next, a sacred elephant must be killed, offstage thankfully, but with much trumpeting and applause. Come and feast on this whale of a production: You will not leave the table hungry. 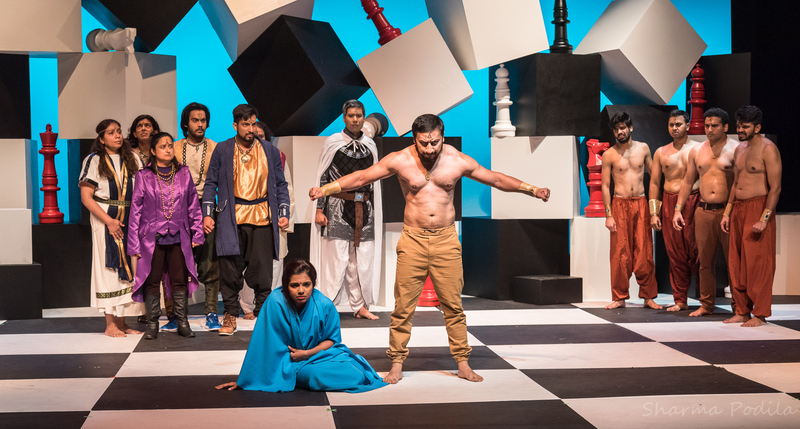 “Mahabharat”—adapted for the stage and directed by Sujit Saraf, music by Nachiketa Yakkundi, choreography by Archana Kamath, Soumya Agastya, Pragya Dasgupta, and Nisha Natraj, by Naatak Indian Theater, in Hindi with English supertitles, at Cubberley Theater, Palo Alto, through Sunday, September 23, 2018. Info: naatak.com. Harshavardhana, Bhavya Shah, Shubham Nigam, Shivangi Sangwan, Tannishtha Mukherjee, Vikram Sharma, Roshni Datta, Maunic Dharia, Geetika Shree, Pragya Dasgupta, Rajul Banthia, and Preeti Bhat.